Become a Trained Health Coach! Health Coaching is a widely used method in health care settings and worksite wellness programming to help evoke motivation out of individuals to work together toward behavior changes such as increasing physical activity, reducing stress, and eating healthier. Apply to become a Cyde Kick here! The Kinesiology department is now offering the KIN 494 course ("Practicum in Motivational Interviewing) to provide opportunities for students to gain practical experience in health coaching skills. 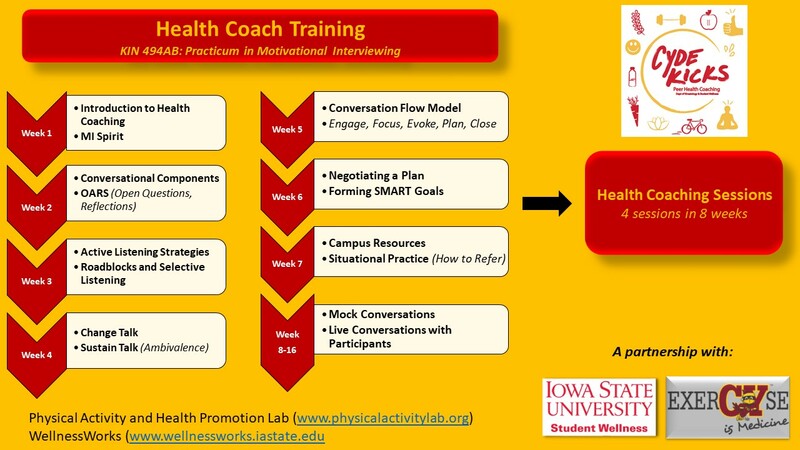 This practicum, coordinated by a team of faculty and graduate students, teach students how to use the skill of motivational interviewing to guide individual's through conversations to evoke motivation to elicit behavior change. Students meet weekly, and are taught the key components that make up motivational interviewing. ​After 7 weekly lessons and intensive practice, students are then paired with undergraduate students to apply their learned motivational interviewing skills in real health coaching programming. The experience can have applications with a variety of health care applications and can also be of value to students interested in dietetics or personal training. For students interested in careers in health coaching, the 2 credit course also meets the practical requirement of the newly established, interdisciplinary Health Coaching Certificate offered jointly by the Departments of Kinesiology, Food Science and Human Nutrition and Psychology. If you are interested in enrolling in KIN 494AB to become a Health Coach, the next session will be offered in the Spring of 2019 on Tuesdays from 2:10-3:00 PM. If you are interested in enrolling in the course, or want more information please contact Katy DeShaw at kjsouth@iastate.edu or apply below by clicking the green "Apply to become a Cyde Kick here" button. All students interested will go through a screening process, and be let into the practicum course by professor permission only from either Dr. Greg Welk or Dr. Laura Ellingson. You may also contact the professors at gwelk@iastate.edu or ellingl@iastate.edu with questions regarding enrollment in the course.